At the beginning of every project there is an idea and above all the courage and imagination to then pursue it. In 2010 Thomas Clamor and Karl Schagerl had the idea to combine Mr. Clamor’s experience in Venezuela, where he founded the Venezuelan Brass Ensemble, with the possibilities, resources and European concept of bringing people together. This was to become the starting point of a steadily growing and developing musical as well as cultural showcase project. You are holding this project’s first great feat in your hands: The European Brass Ensemble. For this idea, two other men were also brought on board, Abbot Georg Wilfinger and Father Martin Rothenender, representatives of the Benedictine Order of Melk. 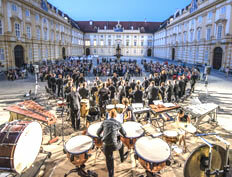 Through this collaboration, a unique opportunity arose to work with the Melk Abbey (Southern Austria), which is one of the most valued cultural and historical estates in the world. It became a patron for the European Brass Ensemble and will always be considered this ensemble’s “home”. The final member to complete this team was the Culture Department of Lower Austria under the direction of Dr. Erwin Pröll, whose financial support made this entire project possible. Already more than 150 musicians from a total of 24 different countries are involved in this ensemble. They have performed at, among others, the 2011 and 2014 Schagerl Brass Festival, the 12th International Brass Festival in Meran in 2013, the 2013 Carinthian Brass Autumn in Ossiach, and the Sauerland Herbst in 2015 as well as having been a regular guest at the “Innsbruck Promenade Concerts” since 2012. The European Brass Ensemble has already worked with James Morrison and Hans Gansch.